Join Percy Jackson, Annabeth Chase and Carter and Sadie Kane as they do battle with an ancient Egyptian magician determined to become a god. 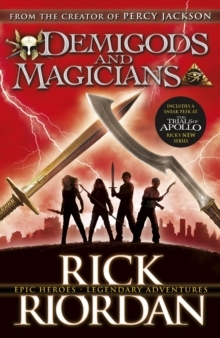 Against impossible odds, the four demigods and magicians team up to prevent the apocalypse. This book contains the short stories The Son of Sobek, The Staff of Serapis and The Crown of Ptolemy, together in one volume for the first time. And, read an exciting extract from The Sword of Summer, the first book in Rick Riordan’s latest series, Magnus Chase and the Gods of Asgard.